FEBRUARY 18—Over the past month, a series of strikes involving some 30,000 manufacturing workers crippled production in more than 70 of 115 maquiladoras in Matamoros, across the Río Bravo from Brownsville, Texas. In at least 48 plants, striking workers, organized in affiliates of the Confederación de Trabajadores de México (CTM), won their demands for a 20 percent wage increase and an annual bonus of 32,000 pesos (about $1,600). Known as the 20/32 Movement, this militant struggle in defiance of the union leadership continues to spread from factory to factory. The strike action has given expression to wide discontent, including among supermarket and sanitation workers, in a city where over 70 percent of the population lives in poverty, and it is beginning to catch fire elsewhere in the maquiladora zone. Amid the strike wave, Susana Prieto Terrazas, a lawyer from Ciudad Juárez, is posing as an alternative to the reviled leadership of the CTM, which has historically been tied to the Partido Revolucionario Institucional (PRI), the bourgeois party that ruled Mexico for most of the 20th century. Prieto announced that she is going to sue the CTM in the capitalist courts and demands government audits of the unions—a grotesque call for state intervention in the mass organizations of the working class. The only reason that state authorities intervene into the unions is to tighten their control over them. Workers must oppose any and every intervention by the courts into the union. It is up to labor to clean its own house. Brutally exploited by predominantly U.S. corporations, the maquiladora workers often earn less than $1 an hour and toil in extremely hazardous conditions. Some are routinely exposed to lethal temperatures and molten metal, as strikers described to our comrades of the Grupo Espartaquista de México. At the same time, these workers are crucial to manufacturing production. By withholding their labor, they threatened the profits of titans of U.S. industry, forcing the maquiladora owners to concede to their demands, even as the bosses have retaliated with hundreds of firings, intimidation and now police repression. This poses the need for joint struggle on both sides of the border against the capitalist exploiters. We print below a translation of a leaflet issued on February 2 by the GEM and distributed to striking workers in Matamoros. 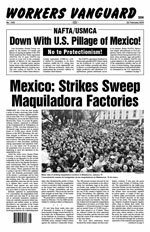 It’s now been three weeks since tens of thousands of workers at 45 maquiladoras [mainly foreign-owned factories] in the border city of Matamoros, organized in the Sindicato de Jornaleros y Obreros Industriales de la Industria Maquiladora (SJOIIM) union, initiated wildcat strikes against the industry’s despicable bosses. The 100 percent increase decreed by the López Obrador government to the ridiculously low minimum wage in the northern border zone yielded few benefits for most maquiladora workers in a region that has one of the country’s highest costs of living. Nevertheless, the capitalists, who don’t want to see their profits reduced by even one iota, seized on the increase to attack previously won benefits. The striking workers have brought the maquiladora bourgeoisie to its knees; as of today, their demands—a 20 percent increase in wages and an annual bonus of 32,000 pesos—have been agreed to at 32 plants. These are without a doubt the most important strikes in decades, and the outcome could mark the course of the workers movement in the near future. The local labor arbitration board declared the strikes illegal, but they nonetheless continue. It also gave the green light for mass firings of striking workers. The intimidation by the [right-wing clericalist Partido Acción Nacional] PAN state government has been unrelenting; but strikers have successfully repelled its police agents. A couple of days ago, a federal judge provisionally rescinded the local board’s decision on the legal status of the strike. The workers should use whatever loophole bourgeois legality offers them to defend their strike. But they should have no faith whatsoever in the capitalist state, which is not an impartial arbiter between the classes. The bourgeois state, whose nucleus is the police, the army, the courts and the prisons, has as its task the defense of the capitalist system of production through the systematic repression of the exploited and oppressed. Regardless of who administers it, this state cannot be reformed to serve the workers and the poor. It is necessary for the organized labor movement to flex its powerful muscle in solidarity with the maquiladora workers. The strike has already spread to the city’s Coca-Cola workers, who belong to the same union, and yesterday to three more maquiladoras, where workers are organized by the Sindicato de Trabajadores de Plantas Maquiladoras y Ensambladoras (STPME) union. We espartaquistas say: For strike action in defense of the maquiladora workers! Organize the unorganized! Immediate rehire of all those fired! The implementation of NAFTA 25 years ago put the finishing touches on a capitalist paradise of superexploitation for U.S. and other manufacturers along the border: cheap labor, tax incentives for the bloodsucking foreign investors and a draconian labor system established by so-called “protection contracts” [sweetheart deals] are comparative advantages that Mexico offers the imperialists. Together with our comrades of the Spartacist League/U.S. and the Trotskyist League in Quebec and Canada, the Grupo Espartaquista de México has opposed this treaty for the imperialist pillage of Mexico from the beginning, and likewise we oppose the new T-MEC [NAFTA/USMCA, see article on page 1]. Matamoros is home to more than 100 maquiladoras, which manufacture auto parts, electrical components, electronic devices, chemical products, etc., mainly for export to the U.S. While the capitalists stuff their pockets, workers’ wages in Matamoros are paltry. (Wages in Mexico are the lowest of all OECD [Organisation for Economic Co-operation and Development] member countries.) In a city of more than 500,000 people, the concentration of workers in the maquiladoras is very important, not to mention the indirect employment that the industry generates. Due to their strategic position in the U.S.-Mexico production chain, the social power of these workers is enormous. According to some corporate associations, economic losses due to the strike amount to $50 million a day! This is what is making the bosses tremble. The workers have also prevailed over the leadership of their union, which has endorsed the strikes only due to massive pressure from the rank and file. Worker disgruntlement with the venal CTM union bureaucrats has exploded. The main crimes of the labor misleaders—corporatist as well as “independent,” whether tied to the PRI or the PRD or Morena [all bourgeois parties]—are abject class collaboration and the subordination of the working class to the capitalists. This has allowed the ruling class to launch attack after attack for the last two decades with almost no response. What is needed is a class-struggle leadership of the unions based on the understanding that the interests of the proletariat are irreconcilably opposed to those of the bosses. The struggle for internal union democracy and independence from the state cannot be separated from the struggle for a revolutionary leadership. As Trotsky himself explained: “In the epoch of imperialist decay the trade unions can be really independent only to the extent that they are conscious of being, in action, the organs of proletarian revolution.” Forging such a leadership means breaking with illusions in the bosses’ parties. López Obrador [known as AMLO] is a bourgeois politician and [his party] Morena is a capitalist party, like the PRI, PAN and PRD. Putting themselves forward as an alternative to neoliberalism, bourgeois populists prop up the capitalist order by reinforcing the chains that shackle the combative Mexican proletariat. By touting the common interests of the “people,” populist nationalism obscures the class line that divides the workers from the bourgeoisie, which exploits their labor. Seeking the support of the oppressed, AMLO’s government only offers an alternative option for the administration of the capitalist profit system and the imposition of its needs at the expense of the workers. This means combining repression and crumbs to keep them in line. Morena and López Obrador are as much enemies of victorious working-class struggle as the neoliberal politicians are, as evidenced by the vicious persecution of the SUTGDF [Mexico City government workers union] and the metro workers union when AMLO headed Mexico City’s government. The national emancipation that the masses yearn for cannot be achieved within the bounds of capitalism. The weak Mexican bourgeoisie is tied by a thousand strings to the imperialists and is incapable of breaking free of its yoke. AMLO supports the intensification of the plunder of Mexico that the new T-MEC brings, for example. The only road to the liberation of the impoverished urban and rural Mexican masses is that of Leon Trotsky’s permanent revolution, which was vindicated in practice by the 1917 Russian Revolution. To satisfy the population’s democratic demands, like national emancipation and agrarian revolution, the proletariat must take power at the head of all the exploited and oppressed by means of a socialist revolution. Having expropriated the bourgeoisie, a workers and peasants government would establish the foundation for the construction of a planned economy and immediately take up the need to extend the socialist revolution to the imperialist U.S. colossus. Emancipation of the working class and oppressed in Mexico is indissolubly linked to that of the workers in the U.S., where millions of Mexican emigrants are a key part of the powerful multiracial proletariat. This underlines the crucial need to build Leninist-Trotskyist parties around the world. The GEM and the International Communist League are committed to this task. Down With U.S. Pillage of Mexico!